Seen last Friday in Antwerp, Belgium. The coo is looking a bit bemused, Ginnie. Ginnie Hart: I know, Ray. I don't think it likes lying down next to the leopard! :"
A rainy day bike. Cows are cool! Ginnie Hart: We were lucky it didn't rain all the time, Larry. And yes, cows really are cool, especially on bikes. Thanks. Lol... Holy Cow is right! ... Do most girl bikes have a low bar like that? Ginnie Hart: Thanks, Jacquelyn. In the Netherlands most girls do ride the low-bar bikes and most guys ride the high-bar ones. But they're also interchangeable, of course. Whatever's convenient, I guess. Great shot and the owner of this bike does not need to be afraid that somebody will steal her bike. I would not want to ride with a cow on the back seat. This is a typical 'Oma-bike' (grandmothers-bike) because of the low bar. I never heard of the brand. Ginnie Hart: I just looked at your link and see all their bikes on that page are out of stock. Maybe there are too many g'mas out there? I think this cow isn't happy about sharing the bike with a leopard?! Well seen! I love that cow! This bike would like to be a leopard and a cow it seems Ginnie! Ginnie Hart: I think that's why the cow isn't amused, Chris!!! Ginnie Hart: Hartstikke bedankt, Philine. Ginnie Hart: HA! It all comes back in a flash, trust me. And btw, Happy Birthday, again. Ginnie Hart: HA! You mean like me, Bill? Thanks. Ginnie Hart: You're right, Richard! That is a highly personalised bicycle Ginnie. A sturdy bar to place it against too. Ginnie Hart: It's fun, Chad, isn't it! Thanks. Ginnie Hart: No hills where we were, Alan, so this would be a dream. Thanks. Very nice bw and framing Ginnie. I like panther design ! LOL ! Ginnie Hart: The rider is definitely an animal lover, Marie. Merci. MOOO!!! I LOVE the spotted chain guard! Ginnie Hart: I know, Helen. This one's an animal lover, for sure. Thanks. Ginnie Hart: Thank you, Vintage. A great capture Ginnie. A very unique looking bike it is. The cow looks a bit surprised by having her photograph taken.Beautifully seen and presented. Ginnie Hart: HA! Now that you mention it, I think she WAS surprised...or not amused! Thanks for the smile. Ginnie Hart: Yes, Janet. One way to find it in a crowd! Thanks. I've seen customised cars but not bikes, love the rear carrier bag. Do you and Astrid have bikes to go out on? 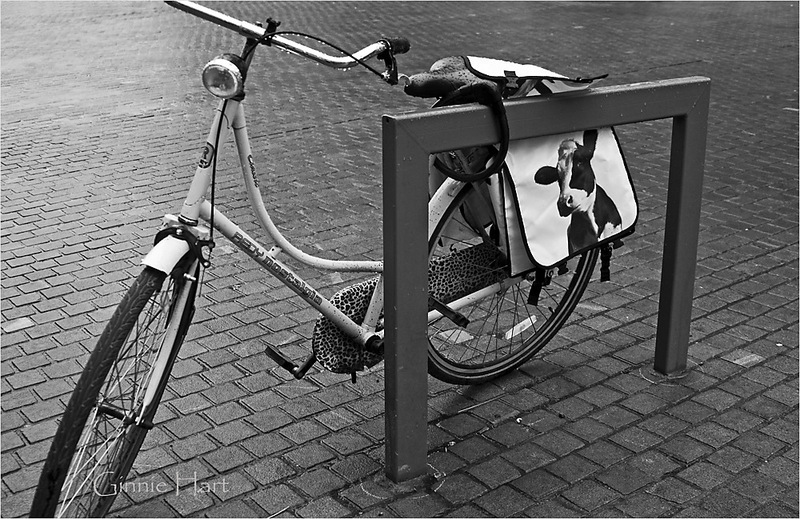 Ginnie Hart: Oh yes, Brian, I've seen many accessorized bikes in the Netherlands and in Belgium. It's fun to see. Astrid and I both have bikes but don't ride that much now...just when we need to or want to. Astrid also has a race bike that she loves to take out on Sundays when the weather permits. Now there's a bike with personality. Bet the owner would be an interesting character. Well spotted, Ginnie! Ginnie Hart: Thank you, Beverly. It would have been worth waiting awhile to see who the owner is! Funky bike Good fun image Ginnie! Ginnie Hart: Sometimes funk really fits the bill, Martin, doesn't it! Thanks. Nostalgia was also in Antwerp - and with his own bike. A bit far to pedal. Ginnie Hart: Nostalgia is everywhere, Louis, if we but look! So fun. Thanks. I wonder if the cow realises that saddles - at least good ones - are made of leather. Maybe mother and/or father is closer than she thinks. Ginnie Hart: HA! Good one, George. Thanks. that is the coolest bike haha love love the cow bags, want!! Ginnie Hart: It's fun, Elaine, isn't it! And btw, I'm still thinking about the oil pulling! I may just have to try it! Ginnie Hart: I think we're all laughing, Angevine. Merci. Eh eh, great find Ginnie. It made me smile! Ginnie Hart: Thanks, Richard. Me, too. great visual narrative as customary in yr posts I take the low bar! Ginnie Hart: You're a sweetheart, Juan Carlos. Gracias. Another fine BW capture Ginnie. Ginnie Hart: Thank you kindkly, Oscar. Gracias. Ginnie Hart: HA! Yes. The cow and the Big Cat lie down together. Ginnie Hart: Would that be the chain guard, Sally??? Ginnie Hart: Did you know 'cow' in Dutch is koe [pronounced ku], so here a cow coos! So fun. Thanks. Ginnie Hart: I have a feeling they have all kinds of girls in Antwerp, Peter. Thanks. Ginnie Hart: I agree, Anne. I'll keep the bag and do away with the leapoard skin! Ginnie Hart: HA! Good point, JP. Merci. Last weekend i´ve been to Brussel. Also very good. Ginnie Hart: We both are really getting around these days, Luiza. One day soon we'll actually meet! Ginnie Hart: HAHAHA! I love it, Doug. Thanks. LOL! I opened the image, read the title, then looked again at the image...and laughed out loud! I need to show this to my good friend who is a dairy farmer. Ginnie Hart: It's fun, Sue, isn't it. We see things like this all the time here. Lots of smiles! Thanks. I love this one. The raindrops really make the difference. This is wonderful with the waterdrops! Ginnie Hart: Thank you kindly, Krista, for stopping by and commenting here. Ginnie Hart: Thanks, Sherri! We were lucky that it didn't rain all day but we had some great pics because of the rain we got. i'm a 100% sure a girl owns this bike.. ;D nice shot! Ginnie Hart: HA! I bet you're right, Rian. Thanks.